We recently updated the flow results page to display both high and low level information about a particular flow’s performance. High-level information is displayed in the top half of the page, as illustrated by the image above. The first graph displays message frequency by day, while the second displays frequency by time. You can use these graphs to evaluate your flow’s performance or plan future broadcasts. The pie chart on the right of the page displays both the number and percentage of participants who’ve entered and either completed the flow or exited from it, as well as those who exited before completing it. 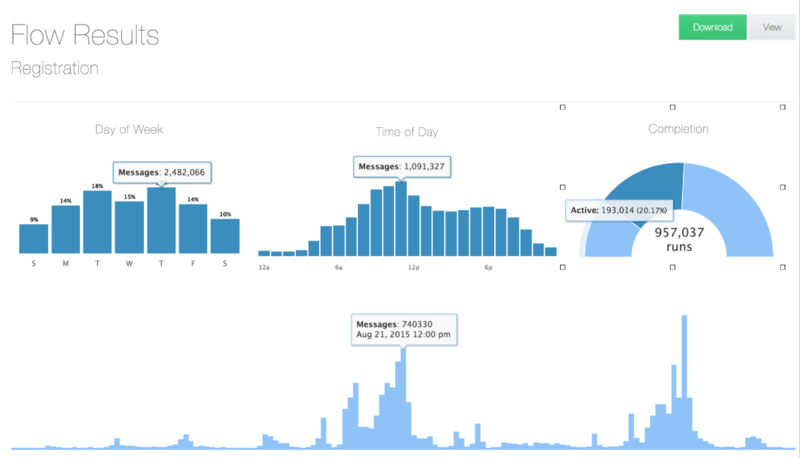 Finally, we included a histogram which displays the total number of messages sent and received by date and time throughout your flow's lifespan. The bottom half of the page lists each run. Here, you can view either the value collected by each RuleSet or the full text of the contact’s response at that particular step. Just click the flow icon to toggle between the two values. Additionally, you can add as many columns as you’d like from the 'Add Column' dropdown. Click the ‘Download’ button in the top right corner of the page to export these results to a spreadsheet. 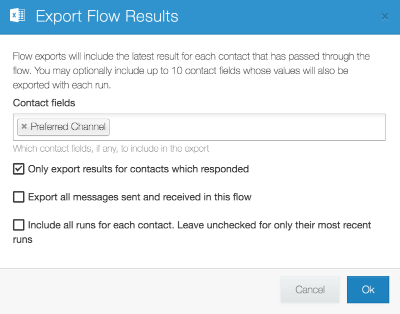 You can include up to 10 contact fields, and choose to limit results to only those who responded or each contact’s most recent run. Charts will only display for flows with 200 or more responses. The histogram pops up after 1,000.